Jake Gosling's winner consigned Southport to a fourth consecutive defeat and took Bristol Rovers into the Conference play-off places. The winger netted the crucial goal from the edge of the box to put the visitors ahead after 13 minutes. Stuart Sinclair and Matt Taylor both missed chances to double the lead as the Pirates dominated the first period. Stephen Brogan and Dom Collins both went close for the hosts, who have now also failed to score in four games. "The lads have given me a clean sheet and we've won the game thanks to a bit of magic from Gosling, which is what this league's all about. "We aren't always going to play well in games and sometimes you have to grind out those results. "But I thought the lads ground it out really well. They've had a lot of plaudits for the football they've played but in football sometimes you have to win ugly and that was an ugly win." 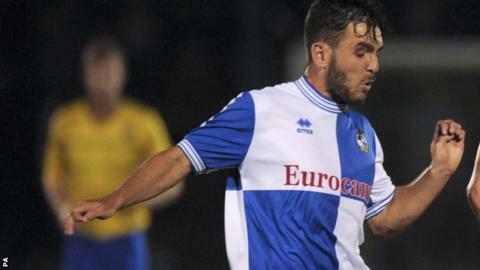 Match ends, Southport 0, Bristol Rovers 1. Second Half ends, Southport 0, Bristol Rovers 1. Foul by Stuart Sinclair (Bristol Rovers). David Fitzpatrick (Southport) wins a free kick. Foul by Tom Parkes (Bristol Rovers). John Marsden (Southport) wins a free kick. Foul by Luke George (Southport). Ellis Harrison (Bristol Rovers) wins a free kick. Foul by Ellis Harrison (Bristol Rovers). Luke Foster (Southport) wins a free kick. Attempt missed. Dom Collins (Southport) header from the centre of the box misses to the right. Substitution, Bristol Rovers. Mark McChrystal replaces Dave Martin. Attempt saved. Dom Collins (Southport) header from the centre of the box is saved. Richard Brodie (Southport) wins a free kick. Attempt blocked. John Marsden (Southport) left footed shot from the centre of the box is blocked. Attempt saved. Ellis Harrison (Bristol Rovers) right footed shot from outside the box is saved. Attempt missed. Ollie Clarke (Bristol Rovers) right footed shot from outside the box misses to the left. Substitution, Southport. John Marsden replaces Clayton McDonald because of an injury. Foul by Richard Brodie (Southport). Tom Parkes (Bristol Rovers) wins a free kick. Foul by Dave Martin (Bristol Rovers). Foul by Ross Dyer (Southport). Neal Trotman (Bristol Rovers) wins a free kick. Luke Foster (Southport) is shown the yellow card for a bad foul. Foul by Luke Foster (Southport). Attempt saved. Matty Taylor (Bristol Rovers) right footed shot from outside the box is saved. Substitution, Southport. David Fitzpatrick replaces Jonny Lynch. Substitution, Southport. Paul Rutherford replaces Scott Kay. Substitution, Bristol Rovers. Ellis Harrison replaces Adam Cunnington. Attempt missed. Stephen Brogan (Southport) left footed shot from outside the box misses to the left from a direct free kick. Foul by Adam Cunnington (Bristol Rovers).